Toddler Approved! : Making the Holidays Cozy! I have been pinning holidays ideas on my Christmas and Holiday Decor pinterest boards for months and I am getting excited to get our Christmas tree up this next weekend once the Thanksgiving festivities are over. Although I already have a long list of activities we want to do in December, I am trying to focus more on connecting with my kids and our family this year instead of trying to have the picture perfect Christmas where we are run ragged and end up exhausted (and sick) by December 25th. When I am picturing the upcoming holidays I picture them filled with lots of hot cocoa drinking, cuddling with my kiddos, doing kind things for other people, making simple ornaments & treats, and spending time together as a family. 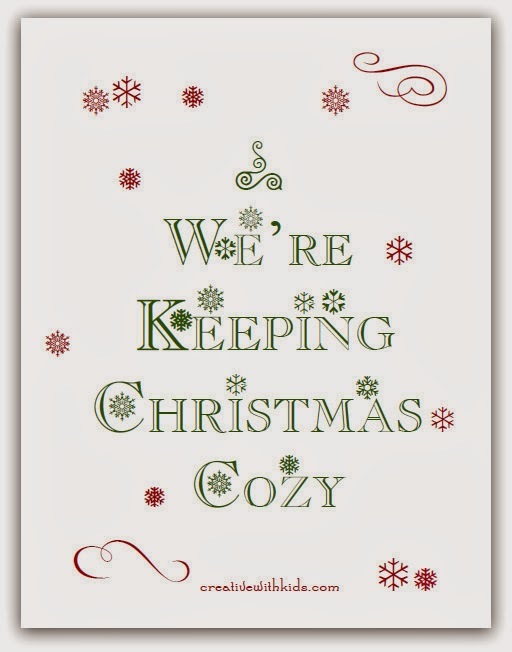 Alissa from Creative with Kids has created a printable pdf for the holidays called Keeping Christmas Cozy that we are trying out this year. The printable pdf is for people who want to simplify and enjoy more connection with their kids over the holidays. It includes both the download with activities, conversation starters and a few craft ideas along with weekly inspirational emails during December for keeping Christmas cozy. 44 Simple Christmas Activities that can be used in an advent calendar or for inspiration. The prompts are easy to implement without a lot of preparation. 36 Christmas Conversation Starters that can also be used in an Advent Calendar or perhaps to start an imaginative chat during dinner. 4 easy recipes for the crafts mentioned in the Christmas Activities page. 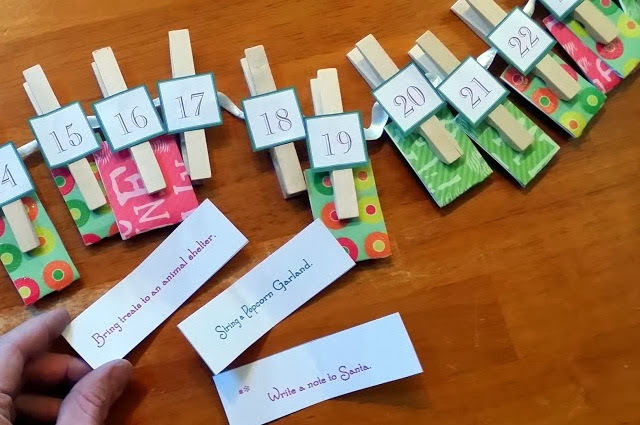 The activities shared in Keeping Christmas Cozy can be used in a simple advent calendar (like this one shared by Alissa or this active advent that we shared last week). Over the next few weeks I'll be sharing how we use some of Alissa's ideas to help us keep the holidays cozy at our house! 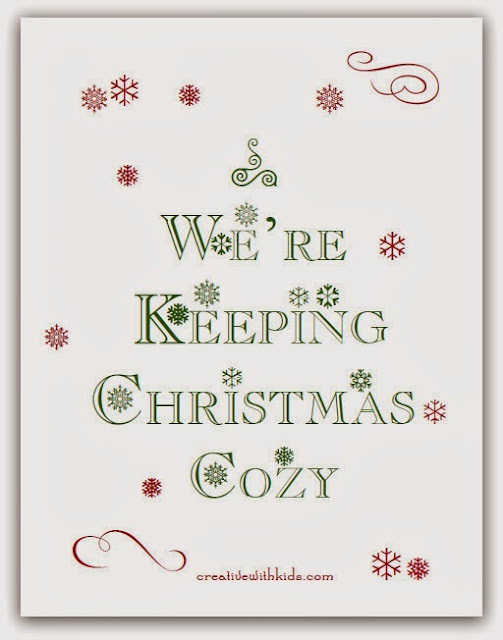 You can purchase Keeping Christmas Cozy for $4.99. Just click here. Getting a weekly email from Alissa is worth more than that to me, so I think this is a super sweet deal (she is such a wise mama... and creative too!). How do you plan to keep the holidays cozy and fun this year? Do you have any favorite traditions that get your family connecting? Please share! I hope you have an amazing Thanksgiving if you are celebrating it today! Don't forget to enter our fun DVD giveaway if you haven't yet. Only one day left! We don't allow our kids to watch tele much, (especially not our almost-3 year old), and no junky foods, so I'm always looking for creative ways to incorporate traditional ideas into our lifestyle. I'm Really excited about this blog; I already adore it.